As I work through the modules and do the readings, I wondered what literacy actually encompasses. I am aware that the course is about literacy but one term has resonated in me: multiliteracy. “Multiliteracy” is a term that was devised by the New London Group which is used to describe “the multipicity of communications channels and media, and the increasing saliency of cultural and linguistic diversity” (1996, p.4). The New London Group’s suggestion that the traditional ideas of literacy and pedagogy surrounding literacy need to be revisited and modified now that there are new forms of communications at the local and global levels. With the term “multiliteracy” in my mind, I searched for the definitions of “literacy” and “literate”, even though they are words that have always been part of my vocabulary. Therefore, the Oxford English Dictionary defines “literacy” as “the quality or state of being literate” and “literate” is defined as “acquainted with letters or literature; educated, instructed, learned” and “one who is able to read and write” (Oxford English Dictionary Online, n.d.). 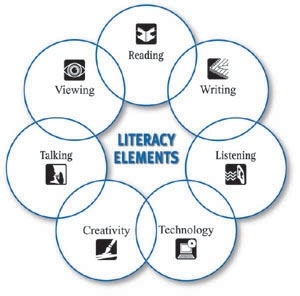 Since “literacy” encompasses reading and writing, which are two of the traditional “3 R’s”, it seems that within the education system, “literacy” has evolved to include many other disciplines and areas of daily life. Educators have attached other words to “literacy” and or “literate”, such as “digital” and “computer”. We have even merged words together to form new ones, such as “number” and “literacy” to form “numeracy”. I think it is important now to expand our view of literacy. The New London Group mentions that the mission of education is “to ensure that all students benefit from learning in ways that allow them to fully participate fully in public, community, and economic life” (1996, p.1). They also mention that education needs to take into account the new technologies becoming more commonplace. Students are bombarded with information from a variety of sources: television, radio, newspapers, textbooks, and the Internet. The Internet, in particular, is one area where students need to know how to navigate. A term used by myself and colleagues is to be “Internet literate”. I use this phrase to describe the ability of students to successfully use the Internet, to be critical of the websites, to distinguish between blogs and academic writing, and the such. There is also the idea of “digital literacy” where individuals are acquainted with using digital artifacts such as computers, LCD projectors, SMART boards, DVD players, and so on. Teachers are using more of the new technologies as they become more “user friendly” to present information to the students as well as creating professional web spaces for classes as a supplement to classroom instruction. It is also expected that students use these artifacts effectively. The teachers’ role has always been in the design of meaning. Teachers provide the resources and conceptualize it to be presented to the students, and then the students make new meanings from the resources. Therefore, more multiliterate the teachers are, the more opportunities are available to students to become multiliterate. Another point to consider when it comes to literacy is that it is important to note that as communication between individuals is becoming more text and digital-based, with SMS messages on mobile telephones and e-mail via the Internet, people are communicating more and more and at faster rates than before. People are also communicating globally more than ever. We send and receive emails almost instantly from people spread all over the world. With that, individuals need to be acquainted with the cultures and languages of those they are communicating with, thus making global literacy another aspect of multliteracy. From a language aspect, global literacy suggests that language has changed; there are different forms the same language. For example, English has changed is different around the world; particularly, when it comes to the vernacular. Phrases and idioms used on the West Coast of Canada will be be different than Eastern Canada as well as those from New Zealand and so on. It is all English but with the influence from immigrating cultures, changes have occurred. Basic communication has changed regarding language and form (e.g. e-mail versus a letter). Therefore, to communicate effectively and be communication literate, students and teachers need to be aware of the minor nuances of language. As educators, it is imperative that we are able to guide the students in understanding the new literacies that are encapsulated within “multiliteracies”. The New London Group states that a pedagogy of multiliteracies “focuses on modes of representation much broader than language” (1996, p.4). This suggests that we need to be familiar with information, digital, Internet, computer, multimedia, communication, audio, mass media, and global areas of literacy. Educators need to modify and make adjustments to the diversification of classrooms. We need to identify the languages, influences of technology, and interests of students to make it more meaningful and ultimately, be more successful at participating in their personal and professional lives locally and globally. The goal of educators is now to guide students to become acquainted with many technological, media, and global areas: to be able to successfully navigate in a world that provides each individual with massive amounts of information in fractions of seconds. This entry was posted in Commentary 2 and tagged adora, commentary_2, communication, Definition, digital, education, language, learning, literacy, literate, media, reading, technology, writing. Bookmark the permalink.